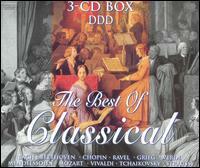 Antonin Dvorák; Antonio Vivaldi; Edvard Grieg; Felix Mendelssohn; Franz Schubert; Frédéric Chopin; George Frederick Handel;... New. Very good in very good packaging. 3 discs. Originally released: 2002. set of 3 CDs, with box, With it's Art/ box, Not an Ex-Rental, clean/no scratches, excellent references, mails next day, Priority Mail available at purchase. Made in Holland.